More and more businesses are discovering the advantages of using sandblast adhesive vinyl. It is an easy and affordable a way to give your retail windows, glass doors and showers the look of expensive frosted glass. Vinyl graphics are the perfect use for store front windows; office doors and anything glass, with additional benefits that include saving energy by reducing heat, filters UV rays, privacy and security. Domed Labels magnifies and gives depth to the printed image! Domed labels are used in many applications, equipment manufacturers apply them as permanent marking for their products as they are durable and their three-dimensional appearance catches the eye. Domed labels are much more permanent than many other labels and do not show wear; the clear polyurethane substance, even after hardening, is stunning. 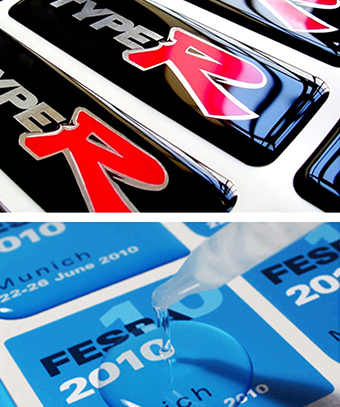 The ultra clear surface coating is not only extremely tough but it enhances, magnifies and gives depth of colour to the printed image that it encapsulates and protects. A proven winner. Your corporate logo on any product will never look so good or last so long.